This modeling study examines the possible functional roles of two hyperpolarization-activated conductances in lateral superior olive (LSO) principal neurons. Inputs of these LSO neurons are transformed into an output, which provides a firing-rate code for a certain interaural sound intensity difference (IID) range. Recent experimental studies have found pharmacological evidence for the presence of both the G KIR conductance as well as the inwardly rectifying outward G KIR conductance in the LSO. We addressed the question of how these conductances influence the dynamic range (IID versus firing rate). 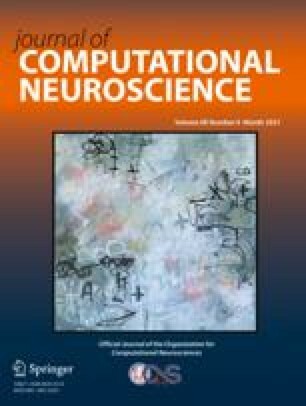 We used computer simulations of both a point-neuron model and a two-compartmental model to investigate this issue, and to determine the role of these conductances in setting the dynamic range of these neurons. The width of the dynamic regime, the frequency-current (f-I) function, first-spike latency, subthreshold oscillations and the interplay between the two hyperpolarization activated conductances are discussed in detail. The in vivo non-monotonic IID-firing rate function in a subpopulation of LSO neurons is in good correspondence with our simulation predictions. Two compartmental model simulation results suggest segregation of G h and G KIR conductances on different compartments, as this spatial configuration could explain certain experimental results.